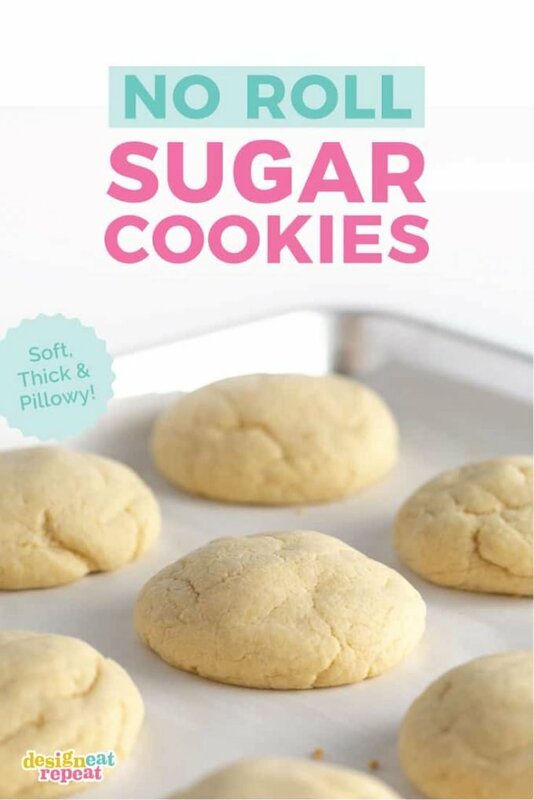 These soft, thick, and pillowy no roll sugar cookies are perfect for when you need to whip up cookies in a pinch. 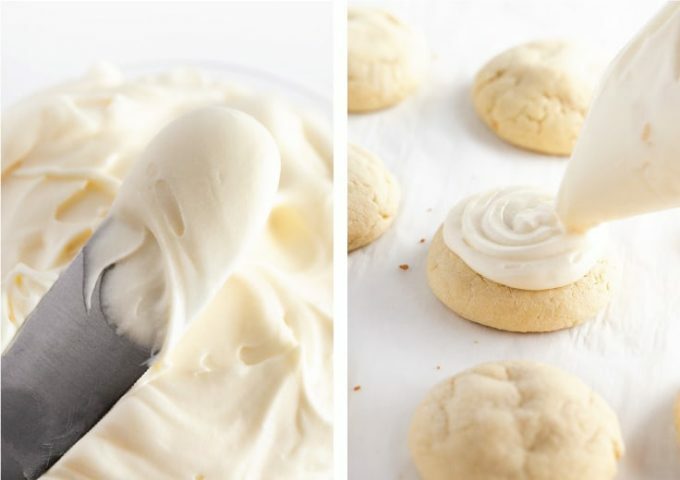 No rolling pin or cookie cutters needed! Enjoy them plain or top with my delicious cream cheese frosting for cookies and then decorate with colored frosting and sprinkles for any occasion! 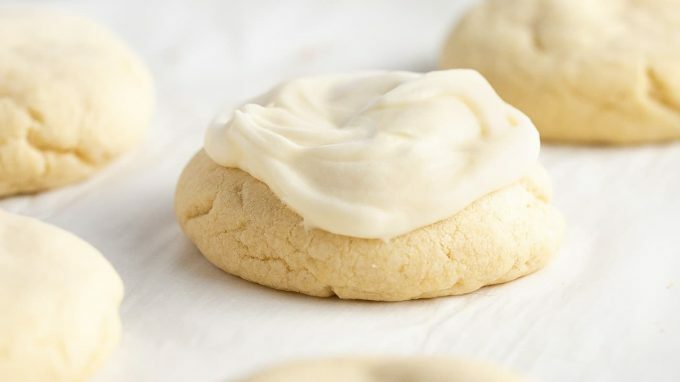 Ever since making my soft & thick lemon sugar cookies, I’ve been itching to try a vanilla version. So when I impulsed purchased a bottle of fancy vanilla extract, I decided it was time to give them a try. 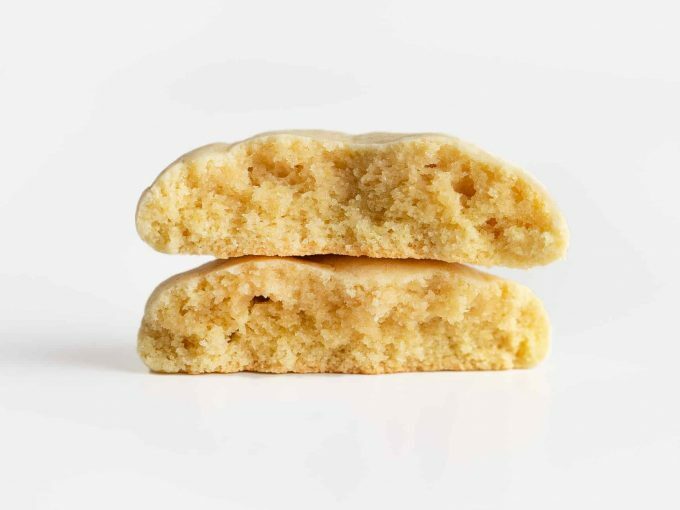 Made using real butter and an extra egg yolk for softness, these no roll sugar cookies are melt-in-your-mouth delicious. 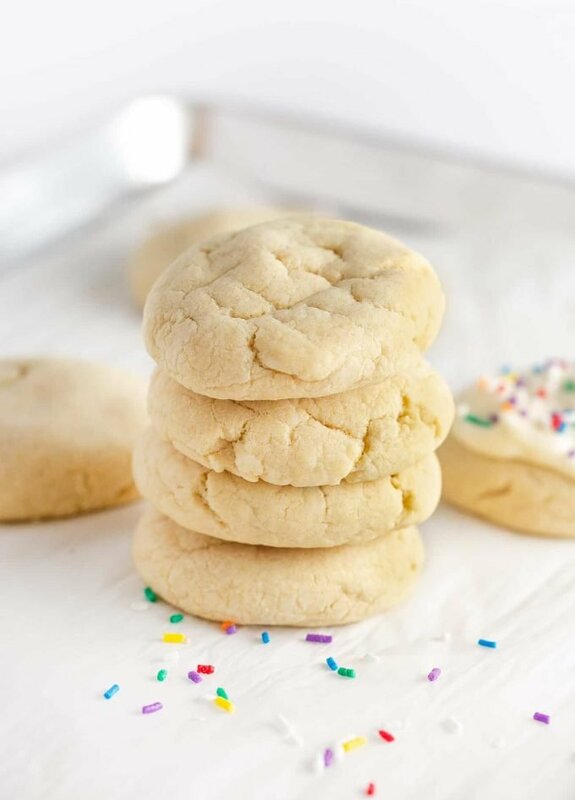 While I believe there’s a time and a place for cut out sugar cookies, nothing can beat a warm fluffy sugar cookie straight out of the oven. Even my sister who isn’t a big fan of sweets said, “I don’t even usually like sugar cookies, but these are the best ones I’ve had”. Mix dough according to instructions in recipe card (below). The dough should be soft, yet hold its form. 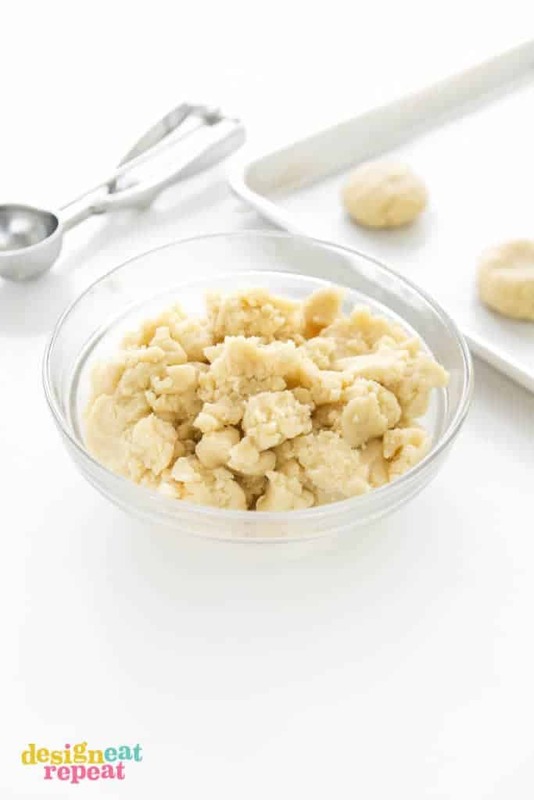 Immediately after mixing, scoop dough into 3-tablespoon sized balls using a measuring spoon or cookie scoop. Lightly flatten each ball before placing on cookie sheet. 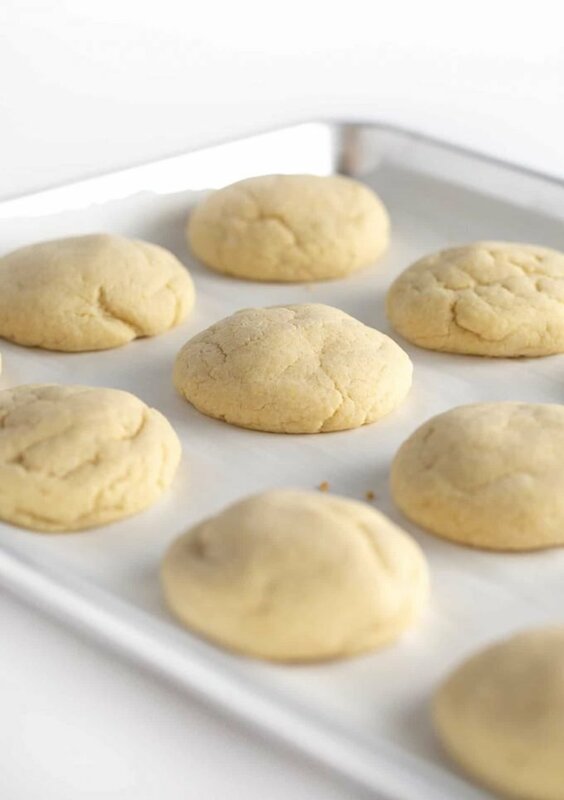 Important: Because this contains melted butter, do not let the dough sit out before rolling into balls & baking or your dough will become dry and crumbly. For this reason, scoop and roll all the cookies at one time. If you only have one baking tray, simply set the rolled balls to the side until the first batch finishes baking. Bake cookies then allow to cool on the hot baking sheet for 10 minutes before transferring them to a cooling rack. This will help them finish baking through. Once the cookies are completely cooled, top with cream cheese frosting and finish off with sprinkles, if desired. 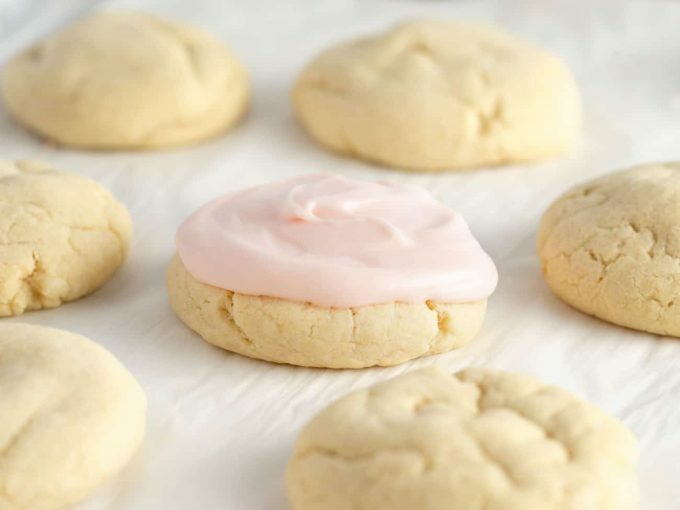 Can you freeze these sugar cookies? Yes! Simply place the cooled cookies in a gallon-sized freezer bag or plastic container and freeze for up to 1 month. 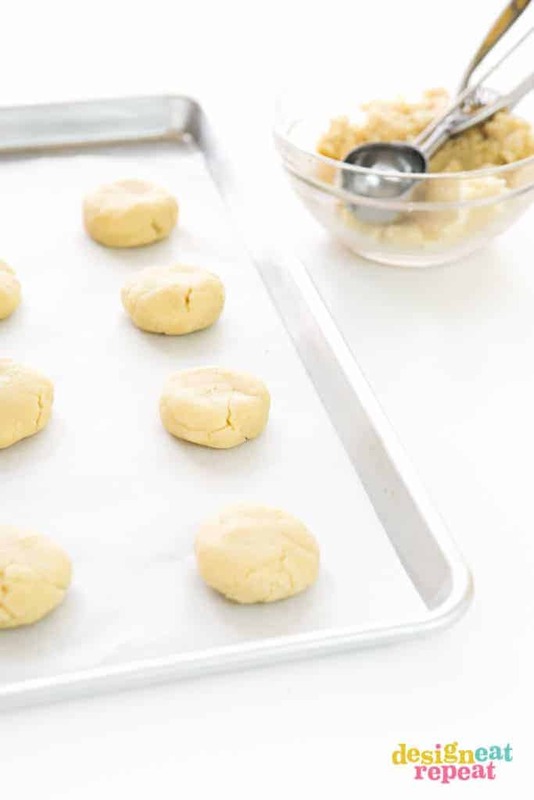 Learn how to freeze sugar cookies for the best freshness. 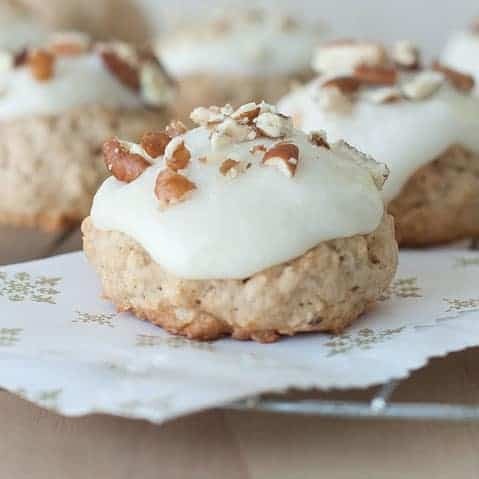 Any ideas to gift these cookies? 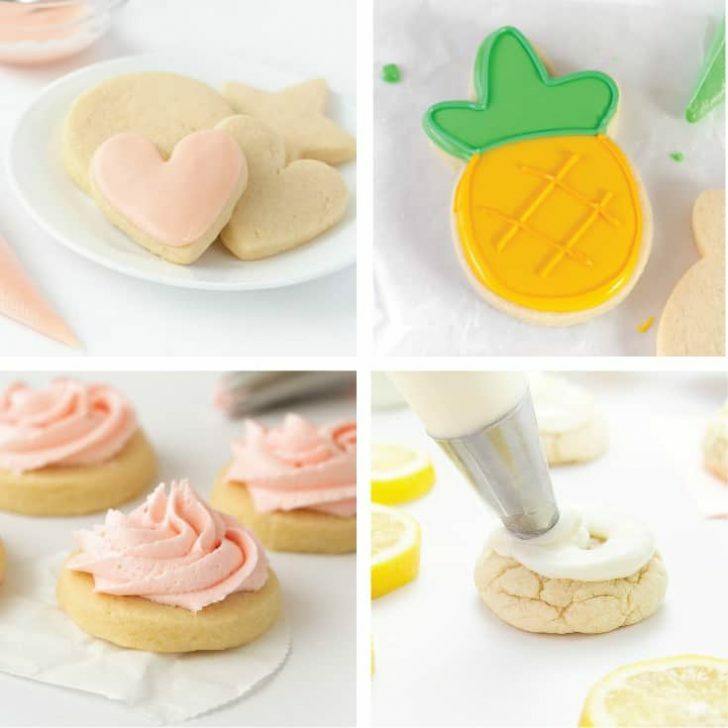 These roll out sugar cookies (unfrosted) would be perfect for gifting in my printable cookie pouches! Before slipping the cookies in the paper pouches, wrap each cookie with plastic wrap. In a small glass bowl, microwave butter until melted. 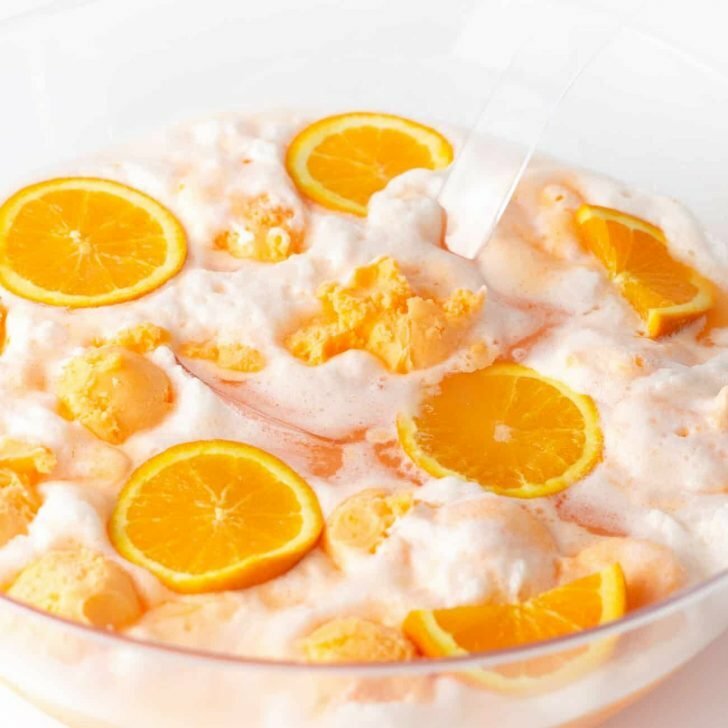 Pour into large mixing bowl. Add in white sugar and powdered sugar and mix for 10 seconds. Add eggs and vanilla then mix on medium speed for 20 seconds. Turn mixer to low speed, and add baking powder, baking soda and salt. Mix for 10 seconds. Half cup at a time, add flour and mix until flour is just incorporate (about 10-20 seconds). Do not overmix. After removing from oven, allow the cookies to cool on the hot baking sheet for 10 minutes before removing them from cookie sheet. 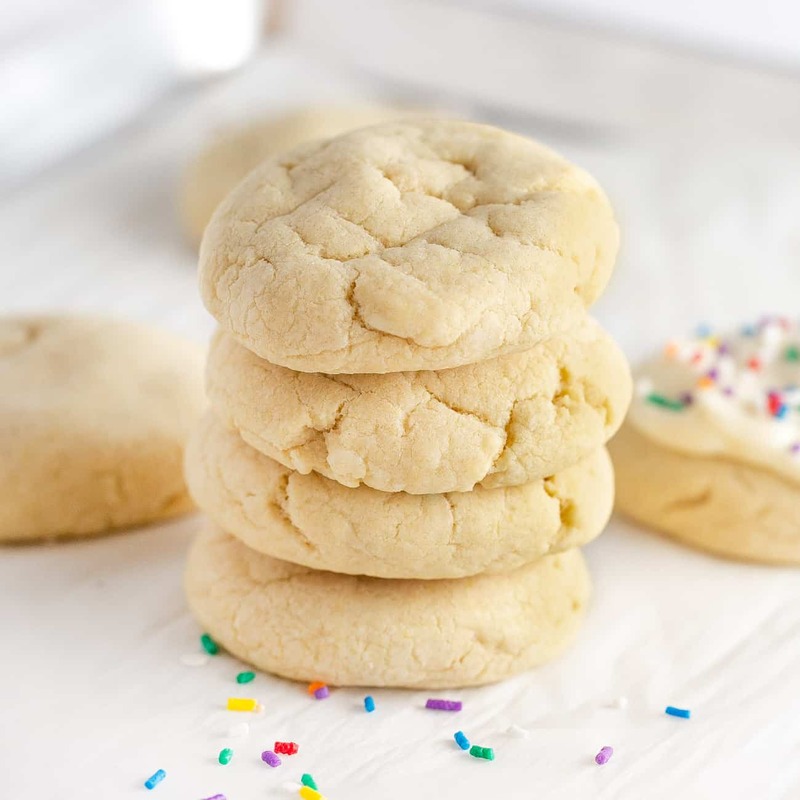 Enjoy plain or spread or pipe cream cheese frosting on cooled cookies and top with sprinkles! 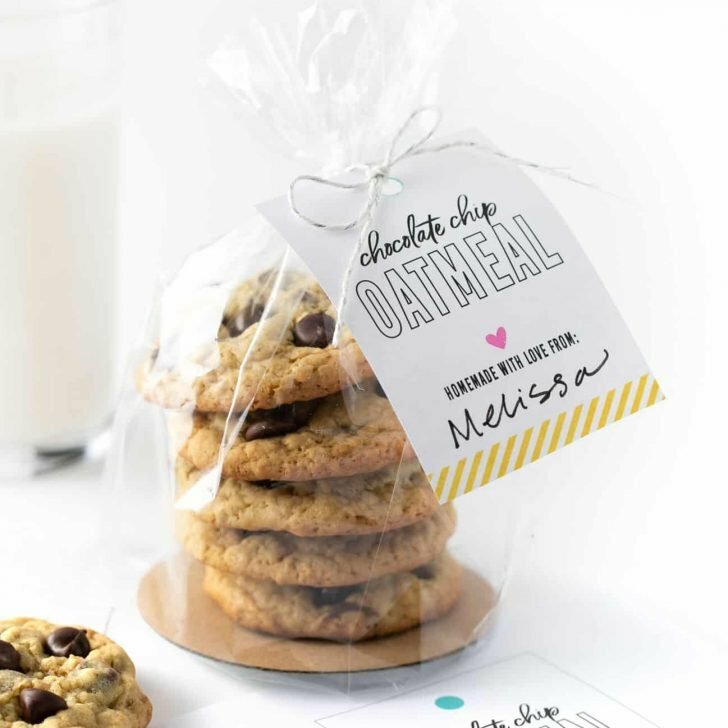 Package in plastic cookie bags (unfrosted) with my free printable cookie tags! The great thing about these cookies is that you can customize them to any occasion! 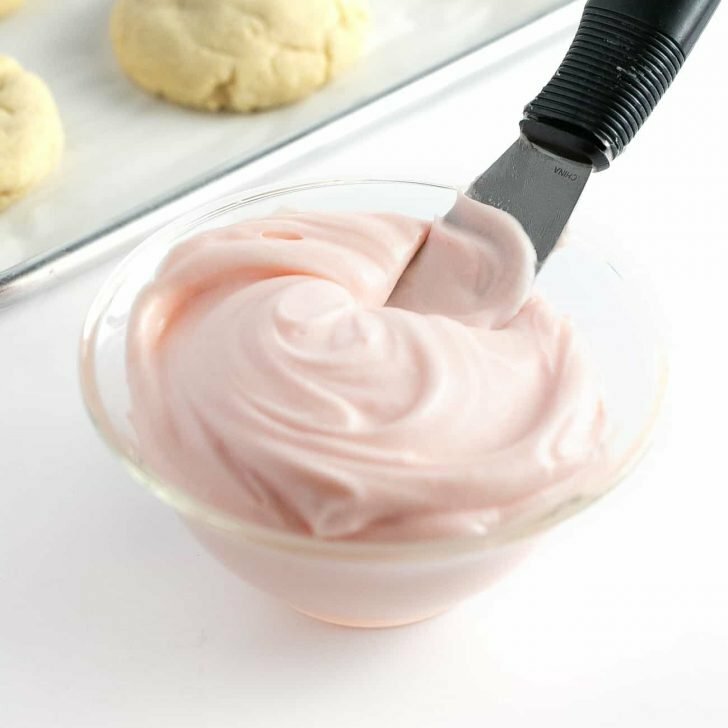 Dye the frosting pink or blue for a baby shower, top with rainbow sprinkles for birthday cookies, or holiday sprinkles for Christmas cookies! 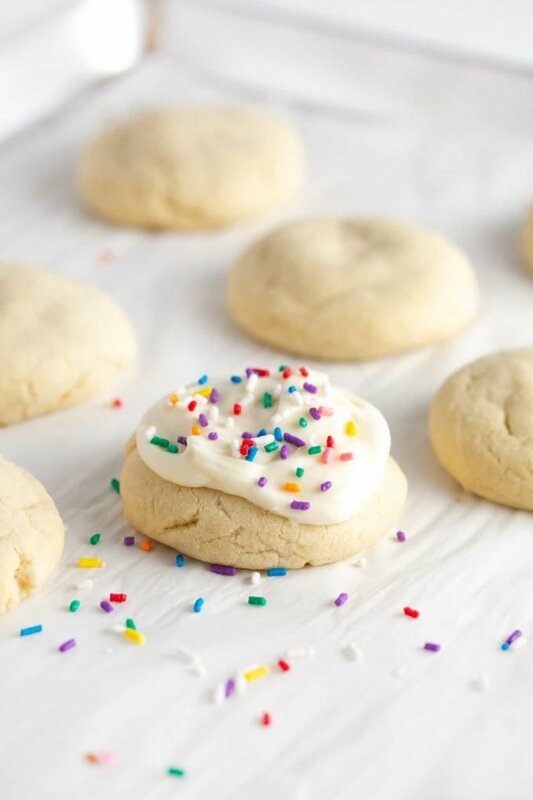 Or for a different variety perfect for celebrations, make my sprinkle sugar cookies (a variation of this recipe), top with cream cheese frosting, then top with more sprinkles!